Transforming the AGO’s Signy Eaton Gallery into a series of snaking walkways and small rooms reminiscent of Beijing’s traditional communal living spaces, the exhibition Song Dong’s Communal Courtyard invites visitors to lose themselves inside a unique installation of 100 vintage Chinese wardrobe doors. Evocative of the contemporary urban experience from Beijing to Toronto, in which traditional architectures and ways of living together are being threatened by rapid growth, this thoughtful, playful and materially rich installation—itself titled Wisdom of the Poor: Communal Courtyard—invites audiences to reconsider how we might hold onto some elements of tradition while radically reimagining them for the present. This installation has changed with each presentation, coming to life each time as a home for other art, and for all those who visit. For Communal Courtyard’s debut at the AGO, Song Dong selected works from the gallery’s collection — works by Murray Favro, On Kawara, Sol Lewitt, René Magritte, Claes Oldenburg and Andy Warhol — which encourage a dialogue about notions of "public" and "private." The AGO has also programmed a series of in-gallery residencies by local artists, who will transform the space in new and intimate ways. Song Dong is a Beijing-based multidisciplinary artist and leading figure within the Chinese avant-garde. 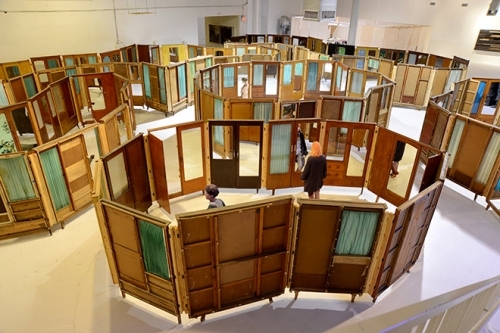 The work presented in Song Dong’s Communal Courtyard is part of the artist’s long-running series The Wisdom of the Poor and makes its Canadian debut at the AGO. Wisdom of the Poor: Communal Courtyard is a gift from the Martin Z. Margulies Foundation, Miami and will remain in the AGO’s collection.